I have covered ladders for plants and ladders for photos. But ladders have spread throughout the house, especially if you find an old, vintage ladder with lots of character. Here are examples of them being used in kitchens, often over the center island. Baskets on top seem to be a common theme. It is a great way to add some storage in a pinch. If you have a small space but high ceilings this would be a great solution shared from Erin on Remodelaholic. 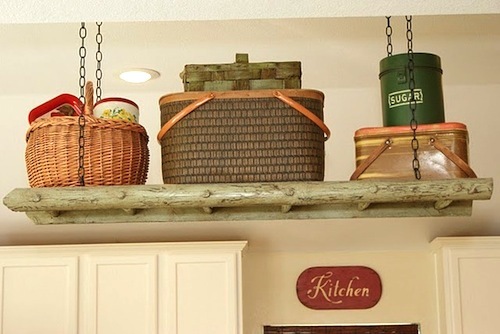 Unfortunately my kitchen has low ceilings so ceiling ladders would not work for me. Another approach is to use the ladder for all the shiny utensils. 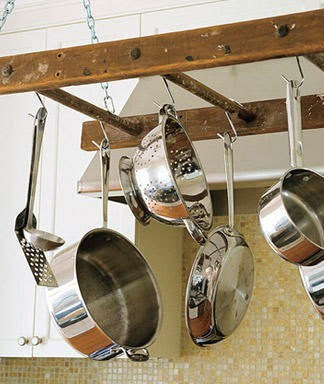 Pans are difficult to fit in many cabinets so let them hang! 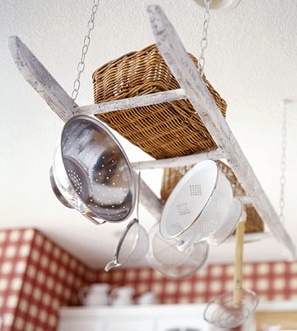 If you have a collection that would most appropriately be displayed in a kitchen then consider hanging it. 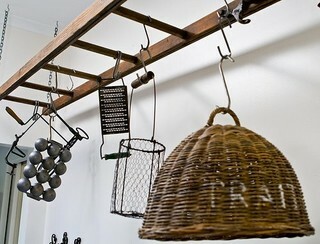 Here are vintage kitchen tools hanging from an old ladder. But the ladder doesn't need to be old. 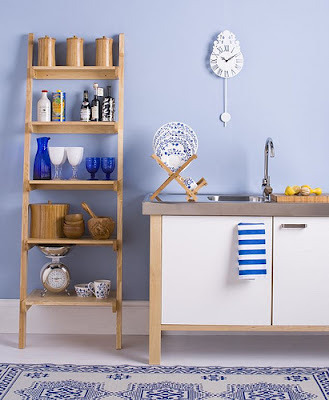 Here is a beautiful arrangement in a decidedly contemporary kitchen using a new ladder retrofitted with shelves. 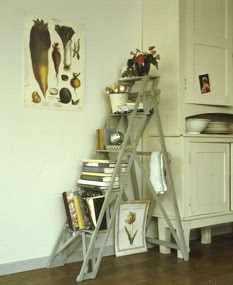 And finally check out this use of a step ladder for cookbooks. Great solution! Your ladder ideas are so wonderful!